One-component Neostik polyurethane foams are used for sealing and mounting, isolating, filling and bonding of various building materials and objects. 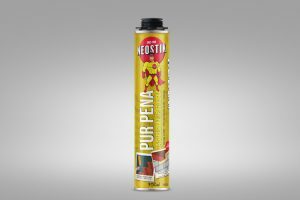 Neostik PUR FOAM UNIVERSAL allows you numerous applications in the construction and electrical installations and it is intended also for filling pipes and other materials. Special formulation ensures good adhesion to many coatings. Neostik GUN PU FOAM UNIVERSAL allows you for numerous applications in the construction and electrical installations and it is intended also for filling pipes and other materials. Special formulation allows ensures adhesion to many coatings. Because of its low expansion and extremely good adhesion Neostik PU FOAM FOR ROOF TILES is particularly suitable for fixing roof tiles. It is resistant to wind and at low and high temperatures. Special formulation provides good adhesion to many coatings. Because of its low expansion and extremely good adhesion Neostik GUN PU FOAM FOR ROOF TILES is particularly suitable for fixing roof tiles. It is resistant to wind and at low and high temperatures. Special formulation provides good adhesion to many coatings. Neostik GUN PU FOAM FOR INSULATING PANELS with low post-expansion is suitable for bonding and fixing of insulation boards and other materials. Special formulation provides good grip on various boards. It made from high-quality raw materials and additives that enable optimal thermal and acoustic insulation. 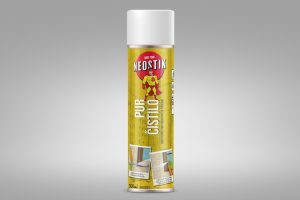 Neostik PU CLEANER removes fresh and uncured polyurethane foam and is also used for cleaning guns. It is suitable for internal and external cleaning of guns. Attached spray cap allows also manual cleaning.